Mykola Romaniuk, from our European Wilderness Network partner the Carpathian Biosphere Reserve, recently participated in the Wilderness Ranger Academy. 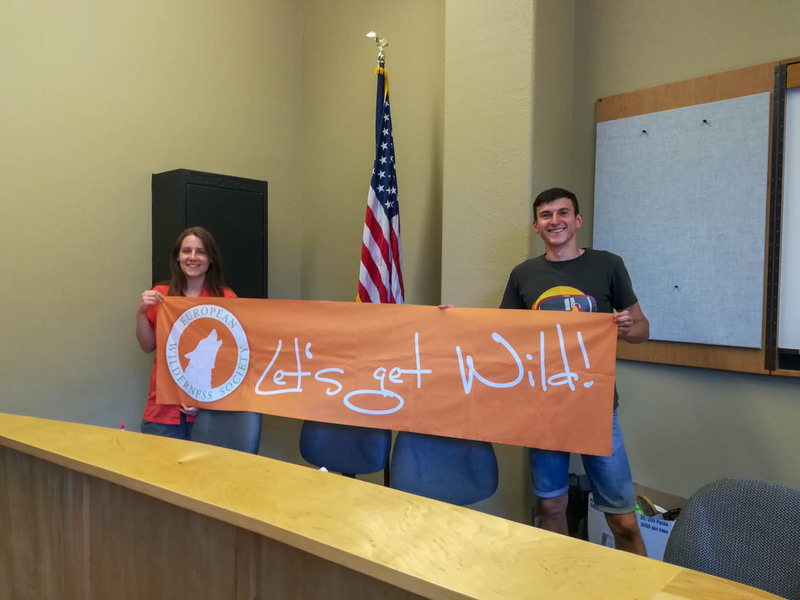 His participation in this event of the U.S. Forest Service was the first international exchange of the European Wilderness Society exchange programme. Our visit to the US earlier this year set the starting point to this international Wilderness exchange programme. We also participated in the Wilderness Ranger Academy, as well as in a Leave No Trace trainer course. The U.S. Forest Service International Program works all over the world and has several projects in Europe. These include several countries of the European Wilderness Network partners. Every year the U.S. Forest Service International Program invites international guest to their Wilderness Ranger Academy. This year’s guests came from Ukraine, Georgia, Albania, Russia and Bosnia and Herzegovina. They were all, voluntary or professionally, involved with an environmental agency or project the Forest Service worked with. Prior to the Wilderness Ranger Academy the international guests attended an introduction to the Wilderness Stewardship of the 4 managing agencies. A particular focus was of course on the Forest Service. This introduction was held at the Forest Service in Lakewood, Colorado. Every guest shortly presented their work or role in their protected area or organisation to the office’s employees. After this orientation, the international guest were driven to Red River, New Mexico, by Ralph Swain, who was one of the organisers of the Ranger Academy, and Nick Walendziak. Additionally, Bella Gordon of the Forest Service International Program accompanied the guests during the Ranger Academy. While the European Wilderness Society attended the Leave No Trace trainer course, the other internationals participated in a trail maintenance course. Some of the international guests regularly deal with trail building and maintaining in the course of their work. For others this course was their first experience on the matter. Eric Gordon, of the local Forest Service district, was the instruction of this course. Equipped with all the necessary safety gear, helmets, gloves and eye protection, they worked on trails at the local ski area. On the first day they prepared a trail for the next steps in the building process. This included cutting branches, cleaning the trail from dead wood and stones. This was done with hand saws. On the second day the actual trail building took place. Appropriate trail building tools, such as a Pulaski and McLeod, were used for this. The evening of the second day of the trail maintenance day was also the beginning of the Ranger Academy. The participants gathered at the campground to get to know each other. The trainings of the Wilderness Ranger Academy gave the rangers the necessary legal and practical background to guarantee for their safety while being out in the Wilderness. Mykola Romaniuk was one of three of the international guests who had the opportunity to shortly present their conservation work and protected areas. His comprehensive presentation of the Carpathian Biosphere Reserve offered a good impression of the area and his field of work. Training sessions like orienteering, Wilderness first aid, risk management, an introduction to rigging and teaching Leave No Trace to kids offered an overview of a Wilderness Ranger’s toolbox. Further sessions dealt with bear safety, knot tying, axe skills and how to pack your bag as well as the concepts of “Authority of the Resource” and “WISDOM”. These two concepts offer guidelines on how to educate visitors from the perspective of nature rather than the law. Several examples gave the participants the opportunity to see different approaches and solutions to interact with violators. In particular the rafting trip to the Rio Grande left lasting impressions with our participant from the European Wilderness Network. Mykola also participated in the backcountry cook-off. He prepared a tasty traditional Ukrainian dish called Kulesha made out of potatoes and cornmeal accompanied by a sour-cream and egg sauce. The dish got a lot of positive feedback and just slightly missed the top 3 ranking. Since his arrival back in the Ukraine Mykola is preparing his next steps. He is working on a presentation to show his colleagues at CBR what he learned at the Wilderness Ranger Academy. This presentation should give new and useful inputs. In particular the trail building and maintenance impressed Mykola. The emphasis on safety for visitors as well as to protect nature is something he wants to carry out in his protected area with the help of the director. The camp ground infrastructure, particularly the vault toilets, gave Mykola another inspiration to take home. He already requested a project concerning the implementation of such toilets and we will support him in the implementation of it. Join the Wilderness Ranger Academy 2019! We are delighted to announce that the U.S. Forest Service, in cooperation with the European Wilderness Society, is able to host several European Rangers from the European Wilderness Network at their next year’s Wilderness Ranger Academy in Region 2 (Rocky Mountain Region – Colorado, Wyoming, Kansas, Nebraska, South Dakota) organised together with Region 3 (Southwestern Region – Arizona, New Mexico)and at the academy in Region 5 (Pacific Southwest Region – California). The event will take place in the first week of June, proposed date for Region 2 and 3 is June 3rd to 7th 2019.